Humanoids evolved from their pre-human ancestors in Africa and appeared there some 2 million BP. After their first find spots they are named Homo Heidelbergensis. This extinct species of the genus Homo lived in Africa, Europe and Western Asia and survived until 200.000 to 250.000 BP. They are possible the direct ancestors of the Eurpean Neanderthals and the Asian Denisovans. 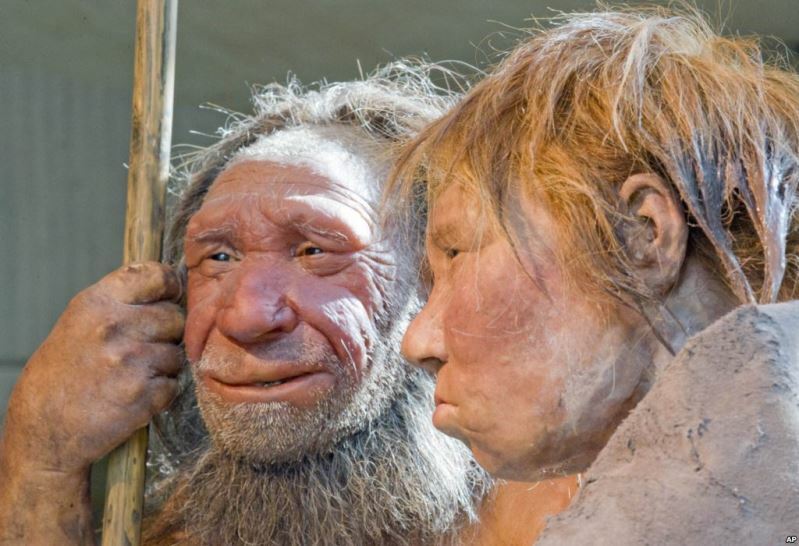 Reconstruction of a Neanderthal man and a Homo Sapiens woman in a museum in Mettmann, Germany. These first hominides were succeeded by the Neanderthalers. The split between the Homo Sapiens and Neanderthalers is estimated to have occurred in Africa between 500,00 - 400,000 BP based on calibration of the human mitochondrial clock using ancient genomes. The world's very first Neanderthal remains were discovered in Belgium in Engis, a suburb of Liège, in 1829. In Belgium other sites were later found at Sclayn, Spy-sur-l'Orneau, Trooz, La Naulette and Veldwezelt. Neandertals ware named after the Neanderthal (Neander Valley) the archeologial site in Germany where in the year 1856 archaeological skeletal remains are found and have been described for the first time in the well-known German thorough manner. 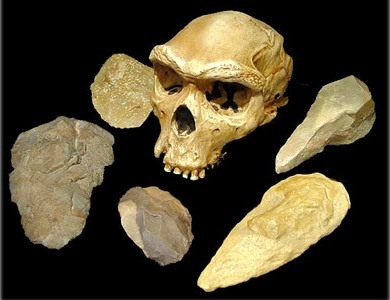 Archeolic remains left by Neanderthals include bones and stone tools, which are found in Eurasia, from Western Europe to Central and Northern Asia. Skeletons and stone tools have been found in Israel, which date from 120.000 to 150.000 BP and in southern China from about 130.000 BP, as well as a suspected necklace of eagle talons that would have belonged to Neanderthals living in the same time in present-day Croatia. At these sites remains are found from who archaeologists could determine the genome. The mtDNA sequences of Neanderthals are completely outside the present human variations; the same applies for the Y-DNA if the age of the first common ancestor is proposed as being younger as a result of reduced diversity, caused by major population declines during which lines became extinct, which could have been a common occurrence. The Neandertalers had only 4 copies of AMY1 in their saliva, wiule we have in our genes many copies of the α-amylase gene AMY1. In each population ranging from 4, at some Finns, to 18. Europeans usually have 15. Very likely they got after eating of roots and tubers abdominal cramps and diarrhea. Their food consisted of meat from large mammals, fish and fruit with loose sugar. They were not skilled enough to hunt small animals. A very complete temporal bone with an auditory ossicle: a complete stapes. Virtual 3D reconstruction techniques enabled this ossicle to be extracted virtually. Skeleton of a 2-year-old Neanderthal child found between 1970 and 1973 and named La Ferrassie 8. Collections at the Muséum National d'Histoire Naturelle à Paris. In the Denisova cave in the Altai Mountains of southern Siberia, a finger bone was unearthed which was dated to between 30.000 and 48.000 BP. Their bones were about twice as heavy as that of modern man. 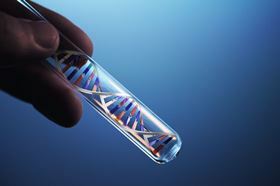 The mitochondrial genome could be determined well. They are a sister group of the Neanderthals. They went apart about three quarters of a million BP. Denisovans have quite a few genes of an older unknown humanoid. In June 2017 is reported newly discovered human fossils from Jebel Irhoud in Morocco. This is dated to 315 ±34 thousand years ago. The oldest Homo sapiens fossils are hitherto assigned to Omo Kibish in Ethiopia, about 195,000 years old, and Herto, also in Ethiopia, about 160,000 years. About 150,000 years ago, the findings of Israel from the Skhul / Qafzeh hominids date. Map of sites with ages and postulated early and later pathways associated with modern humans dispersing across Asia during the Late Pleistocene. Regions of assumed genetic admixture are also shown. ka, thousand years ago. 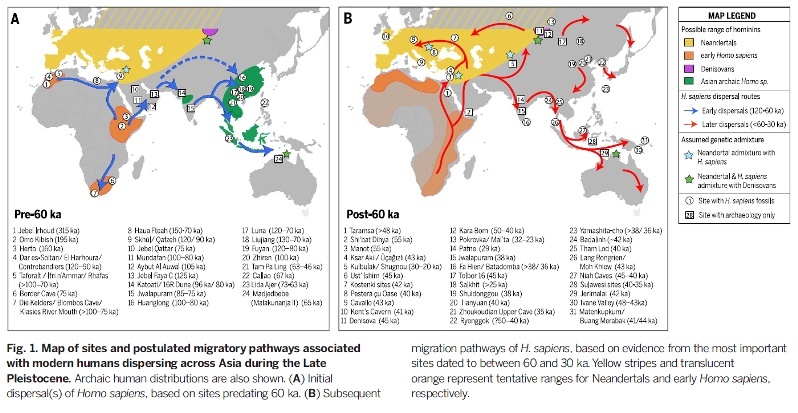 Map of sites and postulated migratory pathways associated with modern humans dispersing across Asia during the Late Pleistocene. 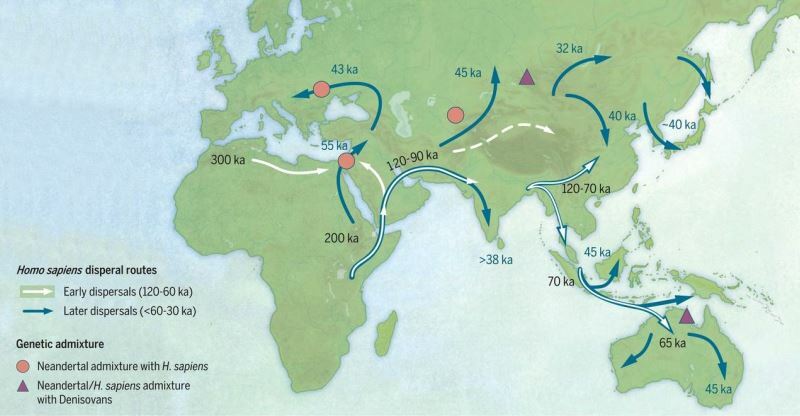 Archaic human distributions are also shown. 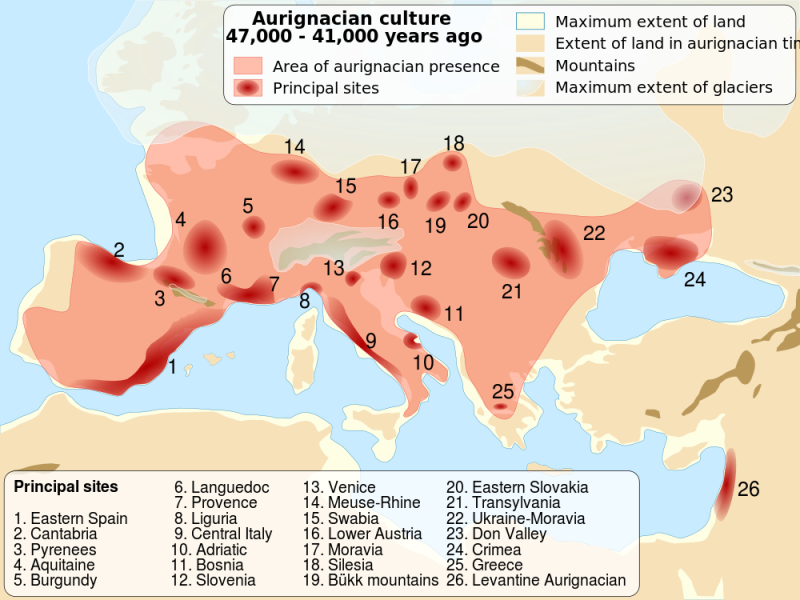 A new culture is now emerging in Europe called the Aurignacian. The name is derived from the French town Aurignac in the Haute-Garonne, an archaeologicalthe location of this culture from the late Paleolithic. The people of this culture produced worked bone or antler points and the earliest known cave art, such as the animal engravings at Aldène and the paintings at Chauvet cave in southern France. 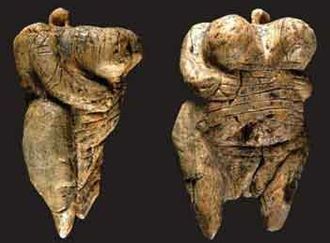 The Venus of Hohle Fels, hewn from mommoth ivory, found in 2008 near Schelklingen, Baden-Württemberg, Germ, dated to between 35,000 and 40,000 BP. The Swabian Alb region has a number of caves that have yielded mammoth-ivory artifacts of the Upper Paleolithic period, totaling about twenty-five items to date. These include the lion-headed figure of Hohlenstein-Stadel, dated to 40,000 BP, and an ivory flute found at Geißenklösterle, dated to 42,000 BP. The Gravettien Culture is the successor of the Aurignacian and dates from 33,000 to 22,000 years ago. It is named after the site La Gravette near Bayac in the French Dordogne. The industry's distinctive stone tool is a small pointed blade with a blunt but straight back, known as the Gravette tip. The most important sites are in Central Europe, Dolní Vestonice and Willendorf. A new people had came in who made new tools. The material remains they left behind include more refined female statuettes, as well as musical instruments and dazzling cave art. They were much more deliberate about burying their dead and as a result we have many more skeletons from this period then we do from the Aurignacian period. The artistic expressions include the often refined "Venus figurines" of stone, bone or clay. The locations are spread over Spain, France, Germany, Austria, Czech Republic and Slovakia. At Dolní Vestonice the Venus statues were not only modeled but also hardened in a fire. A carefully decorated grave was found there, in which a woman of around forty years was laid out, decorated with red ocher. Her shoulder blades were covered with scapula bones of a mammoth, and tools lay with her. Possibly it was a shaman. In Western and Central Europe Gravettian was succeeded by the Solutrean and the Magdalenian. 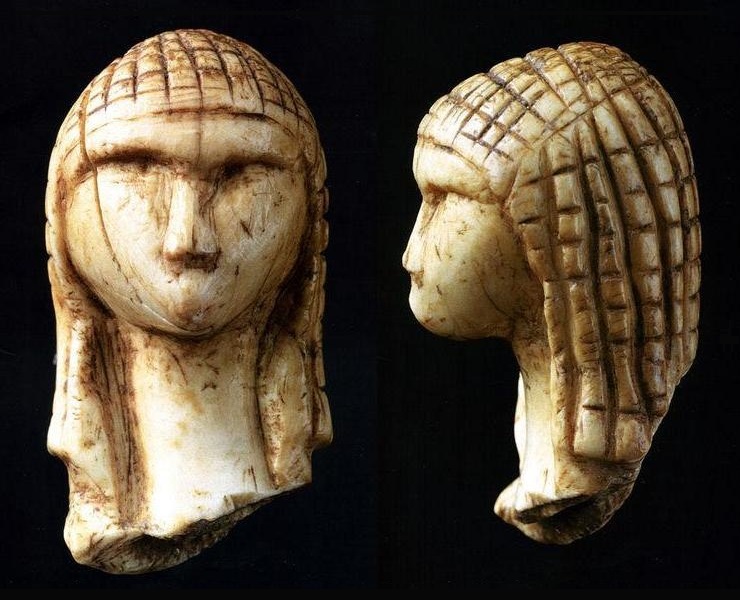 The Magdalenian is one of the later cultures of the late Palaeolithic in Western Europe. It is named after the site La Madeleine in the Dordogne. This period contains many sites and evidence for the hunting of red deer, horses and other large mammals that occurred in Europe at the end of the ice age. The culture was geographically widespread. There are sites from Portugal to far in Russia. 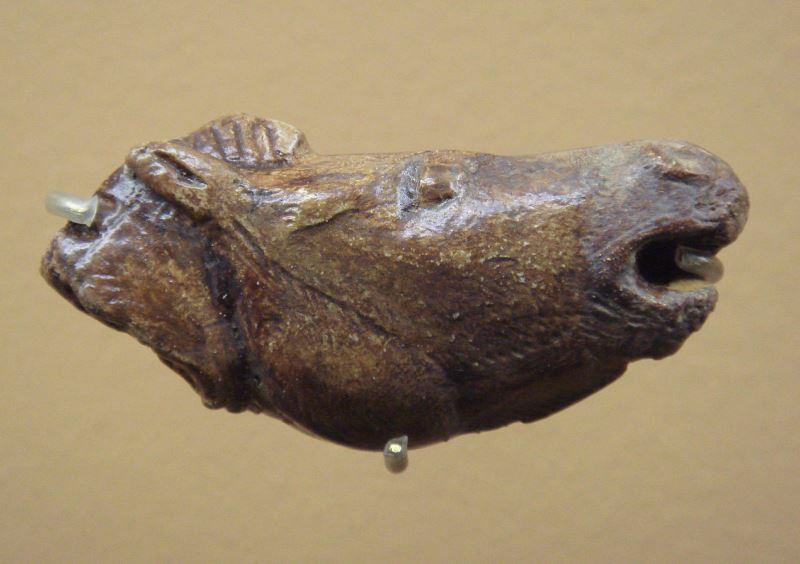 Head of a horse, Magdalenian. This culture was heraldred by a skeleton from present-day Spain dating to around nineteen thousand years ago. Over the next five thousand years they migrated to the Northeast chasing the retreating Ice-sheets into present-day France and Germany. They covered the period from about 19,000 to 10,000 years ago and ended with the end of the ice age. It is characterized by blade industries. Most of the ancestry of the individuals associated with the Magdalenian culture came from the sublineage represented by the thirthy-five-thousand-year old individual from Belgium who is associated with the Aurinacian culture but who was later succeeded at the same site by people who used Gravettian tools and carried DNA simular to others in Europe associated with that culture from Near Eastern origin. The Aurignacian lineage had not died out, but instead had persited in some geografic pocket, possible in Western Europe, before its resurgence at the end of the ice age. A renewal is the microlite. The final stages are characterized by the presence of harpoons, made of bone, antlers and ivory. The Solutrean ca. 22,000 to 16,500 years before today is also one of the last culture stages of the Late Paleolithic. It is named after the site of a fossil coral reef at Solutré-Pouilly, near Mâcon (Fr). The distribution area included southern France, Spain and Portugal and was a refuge for hunter-gatherers at the time of the Last Ice Age. In South Spain, for example, a site has been excavated (Cueva de Nerja) where many fish, including haddock, have been caught: this species is a species that only exists today in the North Sea, the North Atlantic and the Arctic Ocean. The Solutrean has relatively finely worked, bifacial points made with lithic reduction percussion and pressure flaking rather than cruder flintknapping. Knapping was done using antler batons, hardwood batons and soft stone hammers. This method permitted the working of delicate slivers of flint to make light projectiles and even elaborate barbed and tanged arrowheads. Large thin spearheads; scrapers with edge not on the side but on the end; flint knives and saws, but all still chipped, not ground or polished; long spear-points, with tang and shoulder on one side only, are also characteristic implements of this industry. Bone and antler were used as well. The caves of Lascaux in France show the already very artistic expressions of the Homo sapiens, our human species. They date from 20,000 to 12,000 years ago. This last period of the "Ice Age" was a period of climate instability with in it the Bølling-Allerød interstadial period a warm period that ran from c. 14,700 to 12,700 BP. The warming up after the last "Ice Age" started 13,000 ybp. The landscape and the people in it changed rather abruptly. The polar ice rapidly receded north, and the ice caps on the mountains melted. Two thousand years later, the tundra with its reindeer and big game, was almost entirely replaced by deciduous forests from the south, which covered the whole of Europe. About 10.000 BP it was even a bit warmer here than it is now. Though it may seem strange and counter to our natural suppositions, the biomass of forest mammals is less than a third of the biomass of mammals on the open tundra and steppe. Because this wildlife was smaller and faster, it was more difficult to hunt. These animals could also keep themselves well hidden. Therefore, hunting required new and different tactics and forms of cooperation. This change came too fast for most people of that era and, by the final glacial cold phase, the population was already greatly diminished. A further dramatic population decline followed, reducing both the number of population sites and the number of residents in them, and simplifying the culture of Cro-Magnon man until it finally disappeared. These people lived as they always had, in small family groups who came together to form larger groups of twenty to several hundred persons during some periods in the year. They followed the wandering herds of cattle and knew the places where suitable food could be grown in different seasons. They regularly came together in larger groups to exchange products and establish contacts, to marry and to observe ritual celebrations. It was an egalitarian society. Only later did different social strata emerge, as is evidenced by differences in burial gifts and precious goods in some children's graves. This was certainly the case when the wealthier graves were located together. Some cemeteries also contained groups of graves with similar objects, which may indicate different social classes or ethnic groups. In a region in the Near East, the so called Fertile Crescent, lived hunter-gatherers. They roamed this area that was rich in fruits and game. of permanent occupation there is still no trace. The two best known groups are the the Baradostian, 34,000 – 20,000 BP of the Zagros Mountains of western Iran and the Levanto-Aurignacian, 27,000 – 20,000 BP in the Levant. 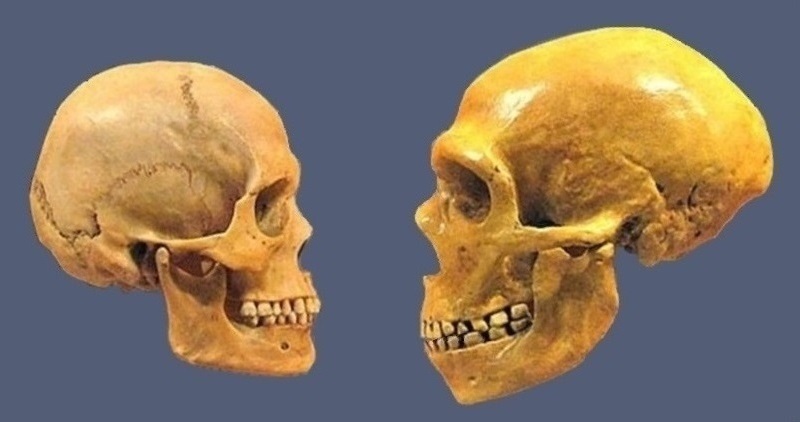 Here people lived with the Y-DNA haplogroup C-V20, this is in a find dated to 15,000 years ago. G was here already split in the first subgroups, G1 especially in the eastern part, G2 in the central and western part. In the Fertile Crescent these populations evoluated gradually to a proto-agrarian semi-sedentary society. In the warm and moist Bølling-Allerød interstadial, 14,700 to 12,700 BP was a rapid population growth and they lived together in a population in a Pre-Pottery Neolithic Culture. In the southern part of the Levant, becomes a special society is forming, the Natufians (14,000-11,500 BP). Their culture rooted in the preceding Kebaran. They had a rather dark skin and had the Y-DNA haplogroup E.
They lived when the Magdalene lived in Europe who had drove the Hamburg hunters northward to the Icerrim. The Natufiers extend southward to the Negev desert and northward to the northern part of the fertile crescent. They were hunters and nomads but also had dwelling places with fixed huts, which sometimes contained 100 kg heavy basalt mortars and pestles in which they processed the wild cereals to flour. In the graves we see utensils and jewelry such as Mediterranean shells and pierced teeth and stones, and a sometimes a dog skeleton. At the end of this about thousand years during cold youngest Dryas period the old knowledge has remained preserved and is passed on. The cornfields are operated again by the Natufians as at Jericho and Abu Hureyra. The population concentration is larger now than ever with up to 500 inhabitants. In the fertile Peninsula, a remarkable amount of cultural diversity soon emerges. Grain silos are built and a wall is being built around the Jericho of that time.Jericho would then be the oldest city in the world. 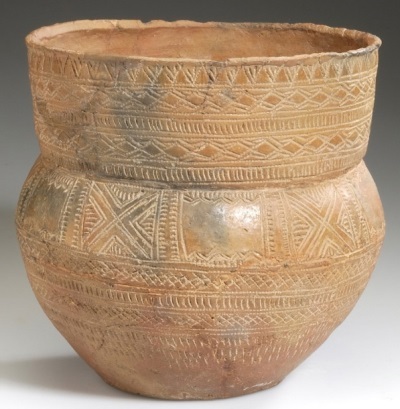 Around 12,000-11,000 BP, humans began practicing agriculture here and started making pottery. The first urban society began in Göbekli Tepe around 11,550 BP (9500 BC). Probably this was a special place of worship, they built here their first temples and homes. 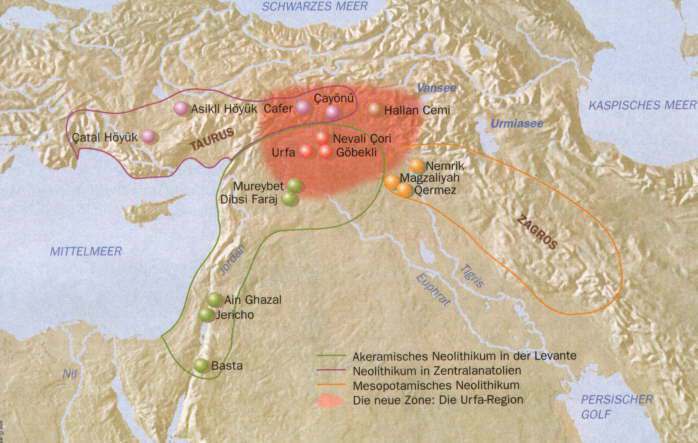 The archaeo-botanical remains from Boncuklu Höyük in west Anatolia to Çatal Höyük in south Anatolia in Turkey and Chogha Golan in the Zagros mountains in West Iran represent the earliest records of long-term plant management. In the north of the Fertile Crescent, between 10,500 and 9,500 BP began the domestication of the four later farm animals, sheep, goat, pig and cattle. "Seated Goddess" figurines from the Halaf Culture c. 7,500 BP, Tepecik-Ciftlik before 8,500 BP, and Çatalhöyük c. 9,000 BP. The first pottery is found in Anatolia at Çatal höyük dated 9000 BP and in Saby Abyad on the Euphrates 8800 BP. Over the next centuries we see it appearing throughout the region. It is a good quality pottery bowl, painted with simple parallel lines in red and black, but also simple, fairly coarse, red-baked pots for general use. Çatal Höyük gives a detailed picture of the changes that occur over time. Prior to 8500 BP there is a serried built up area, which is seen as a high degree of cohesion, but after that the structure differs into a large number of smaller units, separated by open spaces, indicating a shift from collectivity to individual households. At the same time, the number of inhabitants decreases in the old settlement, but it is being established in the flat new settlements. In the Levant the same happened a few centuries earlier. This change is related to the emergence of an intensive mixed farm company, which was created by combining arable farming and livestock farming. As a consequence, revenues increased and the population grew, increasing space for each household. Enterprising children move to new settlements. 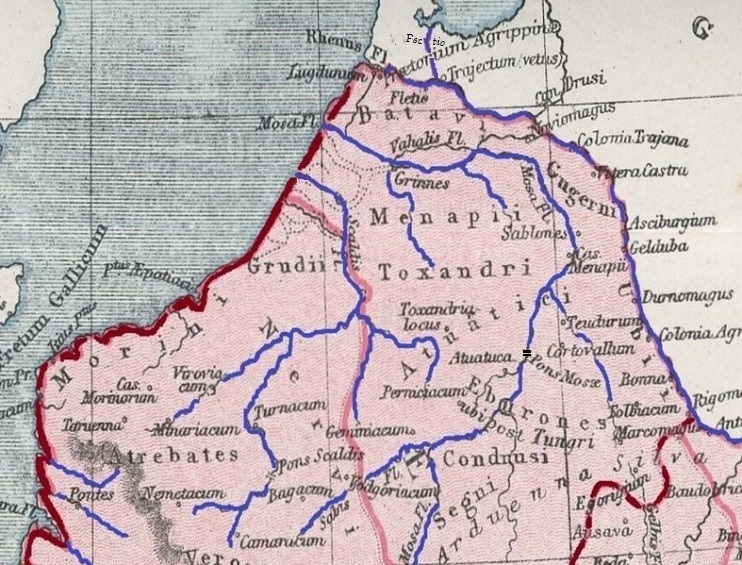 The beginning of expansion to Europe was already before 8500 BP to three regions: the lake area in the south of Antalya, the Aegean coast on both sides of the Aegean sea, and in the Northwest around the Marmara Sea at Barcin. It has been suggested that leaving the ancient great settlements in Anatolia would be the result of the 8200 event, the Misox oscillation. For three centuries it became hotter and drier. Also, because of the rise of the sea level, the breakthrough of the Bosphorus would have given a sudden rise of the level of the Black Sea by tens of meters. This rise of sea is even linked to the mythological stories in these regions, such as the Gilgamesh epic and the Flood in the Semitic and Jewish stories. But centuries before this phenomenon, the trek to elsewhere had already begun. After a period ot two millennia, around 6,000 to 5,000 BP, the farmers in Europe had acquired quite a few genes from the residential population of hunter-gatherers, far more than their ancestors in Anatolia had. What clearly coincides with a degree of knowledge transfer from the residential population to the new population of farmers, such as the use of stone species, obsidian from the Tokij Zemplni mountains and radiolite, a kind of flint, from the Bakony Hills at Lake Balaton. Also a demonstrable part of their food is now also from hunting. Y-DNA G2a was present in the majority of the Y lines of this population, together with the MtDNA K1a12a and X2. This genetic picture remains broadly exist until the Bronze Age. They went from the Aegean maritime region along the coasts of Anatolia and the Levant to Cyprus and Crete. Their pottery is decorated with simple geometric motifs with impressions of various spatulas. It is called Impresso in the Aegean region and in the Levant. In Corfu there comes a variation in their pottery, which is called Impressa. This is going to dominate. There is a leap frogging growth of clusters of residential areas in the Mediterranean coastal plains. Between 7,500 and 7,200 BP, farmers and hunters lived side by side. The farmers in the plains, the hunters around it in the hills. The hunters and fishermen's food is half from the sea, that of the farmers is entirely of the built-up land. A group went in France north along the Rhône and the Loire to the French Atlantic coast. B. The Continental group goes through Macedonia to Serbia and through the valley of the Morava downstream to The Danube and thence through the Danube Valley to Hungary. On the Hungarian lowland, this culture comes 8000 years ago. They continue through the Rhine Valley to the Lössgronden of Westphalia and the Southern Netherlands, along Maas and Jeker. Through exchange within a wide network farmers knew to obtain raw materials from distant regions, such as hematite, an iron oxide with preservative, for example for hides, and hard. black amfibolite for drawbars. Reconstruction of a LBK village on the Cannerberg at Maastricht. The LBK started in Limburg around 7325 ybp(5350 BC) and did not last longer than 230 years. Before the year 7000 ybp he was already over. (67a) In a short time the society has changed completely. Settlements Arise in the form of several hamlets from three to five houses. These houses have a wooden frame with wattle walls covered with loess, such as in Caberg at Maastricht. The dead are buried in joint cemeteries, partly burned partially unburned, close to each other, and got objects with them in the grave. 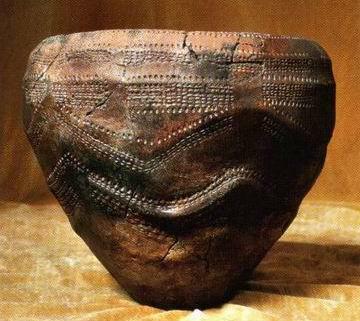 From 7,000 BP, the pottery has two shapes. The famous LBK pottery is quite soft and has open bowls with the typical zigzag straps. The La Hoguette pottery, named after the first location in Normandy, is found across the Rhine and also in our country at Kessel and Sweikhuizen; It is harder and egg-shaped and has a pointed bottom. Until the end, these two cultures flourish side by side. There is a rapid population growth with the farmers, but with the hunter collectors this is not observed. For Germany a growth has been calculated from 8000 people on arrival to 250,000 at the end of the LBK, a growth of 25% per generation. In South Limburg lived in the heyday up to 2000 people. This is as much as the mesolitic population of the whole of the Netherlands. A third pottery group is the Limburg pottery. This can be subdivided into a Rhine-Meuse group and a Seine-Scheldt group and is located in the LBK and La Hoguette area. In the Haspengouw and South Limburg the settlements at the end are becoming smaller and then break down short after 7,000 BP altogether. Then follows a short gap where the old exploits are overgrown. It is unclear where the people stayed thereafter. There is no idea about the causes. The society becomes divided into a number of separate cultural areas, each with their own pottery style, as well as own innovations, such as in the form of axles and housing constructions. Based on the rapid and abrupt changes, it is thought of a crisis by internal causes such as soil depletion together with rapid population growth. A plea here against is that the loess soils are very fertile. Due to population growth territorial conflicts may have been a cause. There may have been be external causes, for example a serious large-scale epidemic. Or a combination of these. The agricultural tradition and the wide exchange network for specific commodities was restored not long after the loss of the LBK by farmers of the Rössen culture, 6,500 to 6,000 ybp such as inter alia in Maastricht to Randwijk. 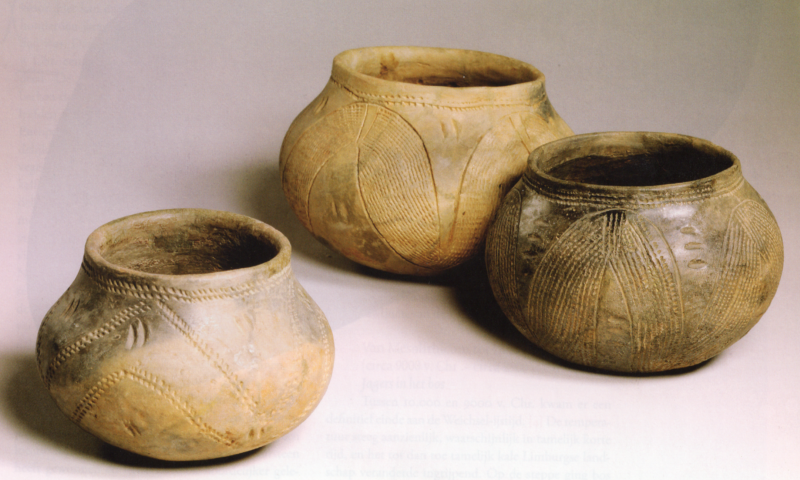 The Rössen vessels are characteristically decorated with double incisions "goat's foot incision". They are best known for their Breitkeile, massive pole axes of stone, which apparently formed a popular export item. They are found far beyond Limburg to in Southern Germany. This was followed by the Michelsberg culture, 6,400 to 5,500 BP. It is a collective name of a large number of related communities. They are known by their Funnel beakers. They lived in the area from southern Scandinavia in the north, the Netherlands to the west, the Danube in the south. In the southeast there was partly an overlap with Lengyel culture. 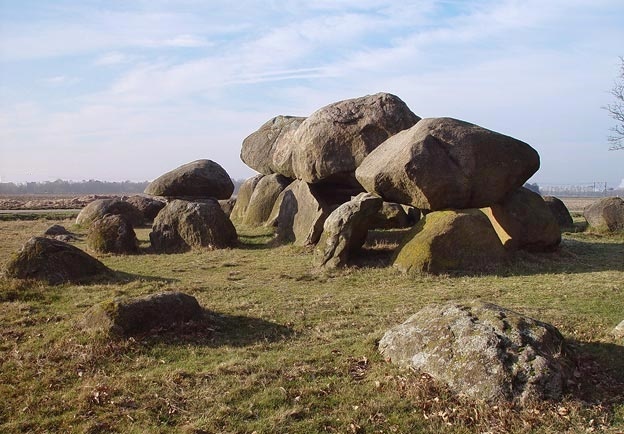 They are the Hunebed builders of Drenthe in the Netherlands. Their residences usually lie on hilltops and have the impression to have been strengthened settlements, indicating restless times. Along the Meuse are found hundreds of sites of their pottery and flint remains. Their residences have been simple because we hardly find relics, but they left the first still visible traces in the Limburg landscape in the form of flint mines, such as in Rijckholt-St Geertruid and Valkenburg. The gray flint blocks were collected to a depth of 12 meters from the lime. With deer horns and flint hoes operators dug an extensive system of deep mine shafts. 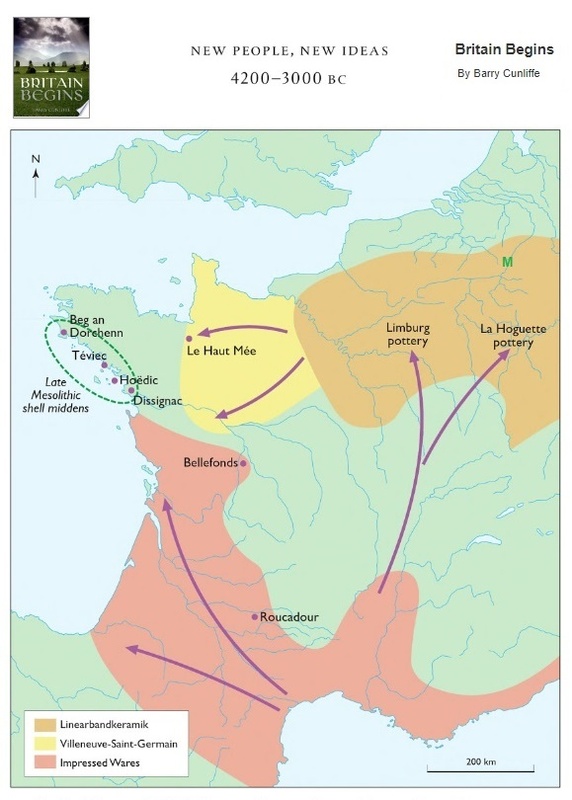 The Neolithic way of life spread into nothern and western France by twoo routes, one through the centre of Europe into Normandy, LBK, the other via the Mediterranean to the Atlantic coast, Impressed, or cardial ware. 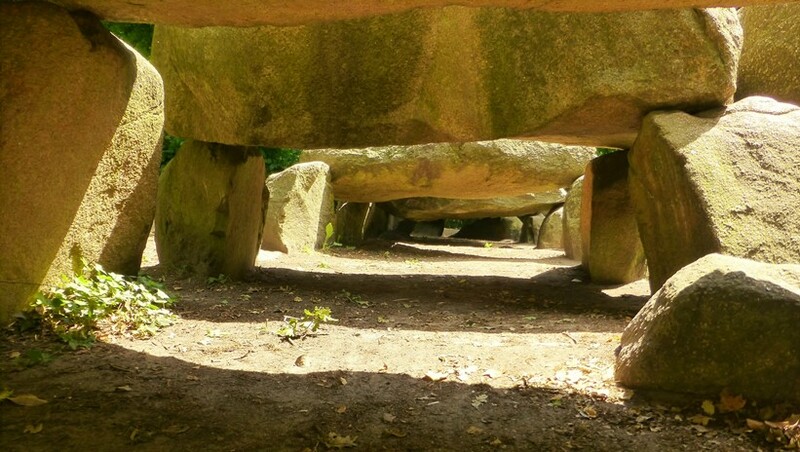 In Brittany they call it a Menhir or a Dolmen, in the Netherlands Hunebed. The oldest in the Netherlands dating back 4,300 years ago. In England, these Burial Chambers were built for the first time a thousand years later. Sometimes they are arranged in circles, in Wales they are called Cromlech, in England Stone circle and Henge. If they find themselves in groups, the British call that a Cairn. The Carpathians, in the Northern Balkans are rich in copper. The first copper ore is mined in where now is Serbia and Hungary from 7400 to 5800 ypp. there are made the first copper weapons, tools and jewelry. A century later the first gold is melted and processed in present Bulgaria. This is traded over long distances en is found in the former pastoralist societies in the southern Russian steppe and in the cultural flourishing Asia Minor. The Mesolithic European Haplogroups are C, F and I. 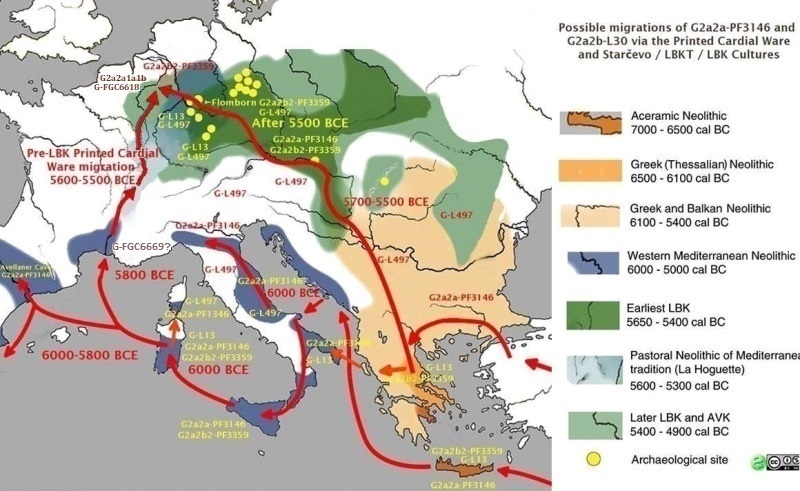 Some I1, most with haplogroup I1a1-P37, and also I2 lineages of hunter-gatherers assimilated with the Near Eastern farmers who had made their way into Europe across the Balkans and the Mediterranean shores. Neolithic individuals from Northwest Anatolia from about 8300 years ago show genetically a homogeneous society with a strong resemblance to the first farmers in Europe. They have the same high percentage G2a that in composition is similar to that of the first European farmers, they have also according admixture analyses a strong genetic relationship. This indicates the now aceepted origin of the first European farmers from this area. The European farmers have mixtures with the indigenous European hunter-gatherers. Such a picture we see also in the Anatolians. The steppes of South Russia were inhabited by a distinctive population of hunter-gatherers with high affinity to a 24,000-year-old Siberian. But the step dwellers of that time were descended not only from the preceding eastern European hunter-gatherers, but also from a population of Near Eastern ancestry although of other origin as in the West. 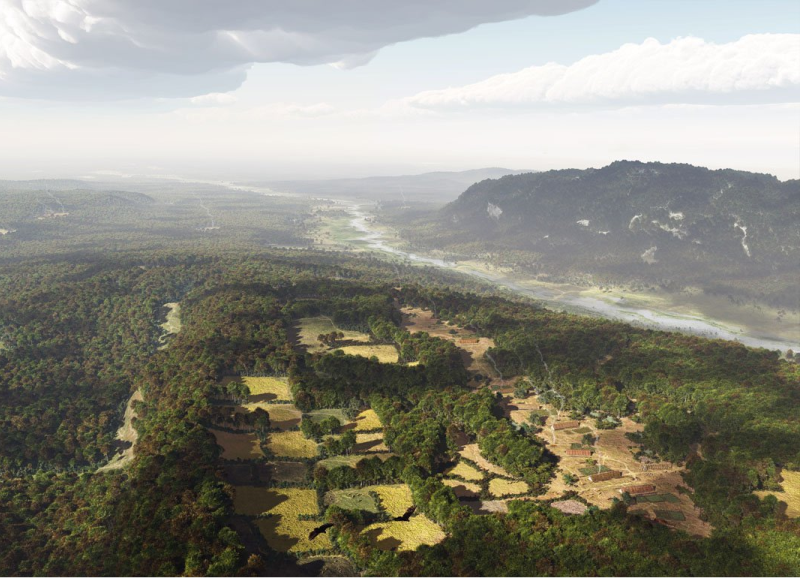 Here flourished during 5,600 and 4,300 BP years ago the Yamnaya Culture. They are held for the proto Indo-Europeans. They are cattle-breeding nomads and the first users of wheeled vehicles pulled by hordes. They bury their dead in pits sometimes covered with mounds that shows their social stratification. They harden their copper to bronze. They start to melt iron from the rocks forming it into utensils and weapons. A new population comes round 4,800 BP from their region. Their pottery is called the Corded Ware culture (engl.) or schnurkeramischen Kultur (Deutsch). They are also called the Battle Axe People. They conquer in short time whole Europe. These people carried distinct genetic markers that allow their movements and genetic influence, present in essentially all modern-day Europeans, to be traced. The dominant Y-DNA, the trunc clades of haplogroup G2a, present in the Neolithic agrarians, is in the beginning of the Iron Age largely replaced by R1a and R1b and some G2a2b subclades, mostly G2a2b2a1-L140. This concerns the Y-DNA of the men. In women, we see this change much less, they are clear, according to the not very changing mt-DNA, included in their midst. (82). The old G population mainly maintains in mountain ranges, the Alps, and on islands, as Sardinia The old original European population of hunter-gatherers with haplogroup I decreases less in number. The grave ritual changed. The dead were no longer buried in a common grave room, but in an individual grave covered by a mound of grass or heather sods. In this time the former permanent settlements have disappeared. There is now clearly a nomadic shepherd population. From the finds of stone wrist protectors one can deduce that they were good archers and from the many finds of imported where it appears that they were trading on a large scale. 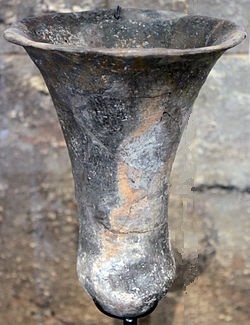 The bell-beaker culture was also the first in Northwest Europe to use copper weapons. In South Limburg started this 4,900 years ago and continued until shortly before the Roman era. Thousands of burial mounds are found consisting of stones and Loess. Considerable persons were unburned in a crouch position with burial gifts such as cups and utensils. 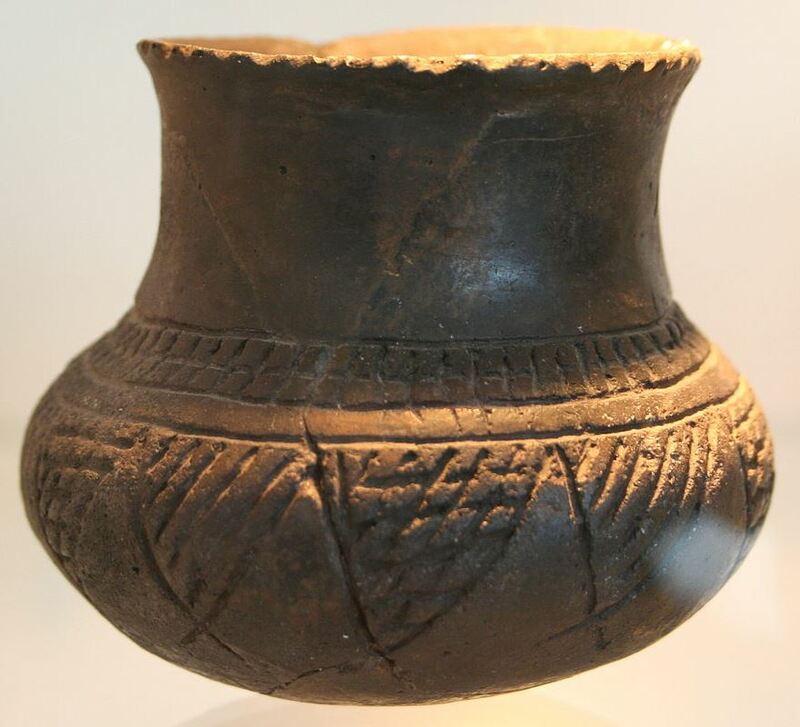 Beginning around forty-seven hundred years ago, a couple of centuries after the Corded Ware culture swept into central Europe, there was an even dramtic expansion of the Bell Beaker Culture, probably from the region of present-day Iberia. DNA shows that individuals in Iberia were genetically indistinguishable from the people who had preceded them. Once the Bell Beaker culture reached central Europe through the dispersal of ideas, though, it spread further through migration. Prior to the spread of Beaker culture into Britain, not a single ancient DNA sample from among the the many dozen Reich c.s. analysed had any steppe ancestry. But after forty-five hundred years ago, each one of the many dozens of ancient British samples they analysed had large amounts of steppe ancestry and no affinity to Iberians at all. The first description of the peoples of our region comes from Gaius Julius Caesar (100-42 BCE) in his book Commentarii de Bello Gallico [Commentaries on the Gallic War], written in Rome in 51 BCE. He begins with: Gaul is divided into three parts, one inhabited by Belgians, one by Aquitanians, and one by Celts, called by us Galli, and of these three, the Belgians are the bravest. The Belgians live north of the Seine and the Marne, up to the Rhine. They tell him that most of them are descendants of Trans-Rhine Germans, who expelled the original inhabitants of Gaul. Some of them took over the names of ancient Celtic peoples: the Atuatuci claim to be descendants of the Cimbri and the Teutons; the Batavians come from Chatti. The island of the Batavians is formed when the Mosa (Meuse) River intercepts a branch of the Rhine (called Vaculus [Waal]), and then flows into the Rhine itself. As this river approaches the ocean, it divides into several branches, forming many large island which are inhabitated by wild barbaric peoples, some of whom live only on fish and birds' eggs. These are the old hunter-gatherers, the Celts, the Sea Peoples, and especially the Germans. The Belgians at the beginning of our era. Hover your mouse over the map to see only the land north of the Meuse. At least so it is told by Caesar, the man who omits many facts to increase his exploits and to cover-up of the genocides and other exaggerates or invents to present these peoples much more primitive than later is found out that they were. He says nothing about their advanced hunting weapons, as their boomerangs, while they have had a lot of hostilities and trade. Caesar mentions clearly intentional not that the Belgian peoples struck their own coins and how rich were their temples. 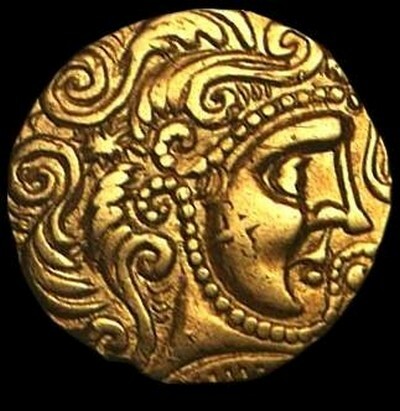 Gold prices fell in the Empire when Caesar sold the many gold items he had looted from the Celtic temples after remelting them to gold bullion. (111). It is clear that the peoples between the Somme and the Weser, the later Netherlands had their own language group, which was different and probably older than the Celtic and Germanic language groups. the different residential areas varied quite often. In this way the Usipeti and the Tencteri crossed in the year 55 BC the Rhine, chased away by the Suebi and settled near their related tribe the Sugambri, now east of Roermond on the river Roer. It was Emperor Claudius, 41-54, who after many unsuccessful attempts to conquer Germania Trans­rhenalis as a border of the Empire at least took the river Rhine. These tribes stayed between the Scheldt and the Rhine. The Aduatuci probably more on the south side of the Somme. This tribe is overcome by Caesar after a final battle at their fortress at the current Thuin. Caesar claims to have completely wiped out the tribe and their wives and children sold into slavery. In 52 form the Eburonic kings Ambiorix, and the old Catuvolcus, together with a number of neighboring nations a confederation against the Romans. The Treveri, Nervii, Aduatuci, Menapii and also some Germans staying on this side of the Rhine join them. Caesar collects four legions and invades the country of the Nervii. He forces them to surrender and takes many prisoners with their cattle, he devastated their country and robs it empty..
Ambiorix is attacked treacherously in his sleep one night. He manages to escape with some faithful and sends messages from across the country that everyone must surrender or find a refuge. Caesar boasts then to have completely destroyed (vastatis) their country as he has done with the Nervii. The Eburones are gone as an independent nation. Pollen Counts in Jülich, the easternmost area of the Eburones show on growth of agricultural land by forests. 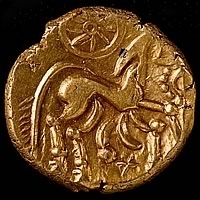 Gold Finds in Heers near Tongeren and Amby at Maastricht are properties that have not been retrieved by their owners. (113). After the book of Caesar there are no written sources about this region. The attention focuses again on the internal problems in Rome as the battle for the emperorship. An indication of how it fared give the pollen counts in Jülich population in our distant region. They show a replacement of farmland by forests. But that's further on in present day Germany. Even if only a quarter of the population of Maastricht and Tongeren survived the disaster of 50 BC. the population will quickly began to flourish. However, no historians in that time have written about the population of this for them distant land. We got no longer names. There are from 43 to 23 BC many indications of small uprisings spread across Gaul, without indicating names or locations. The fortification of Caestert on the edge of the St Pietersberg at Canne south of Maastricht, who as shows dendrologic research is built in 31 BC. indicates such a struggle. We can assume that the population just subsitst. The roman writer Varro cites a visitor of these lands who saw countrymen improve their land with marl in order to reduce the acidity. This limestone is mined in South Limburg around Maastricht. In the years shortly before the beginning of our era flourishes on the banks of the Meuse and Scheldt a pottery industry of red and black plates and cups. produced with the turntable, unprecedented here. At the fertile loess soils flourishes grain production. With the help of German slave labor there is a great for the export referred production of salt, iron, cattle and Ardennes ham. The main road from Cologne on the fertile loess soils over Tongeren to Boulogne sur Mer and on to England is a trade route on one of the most prosperous regions of Gaul. In our region that are the Batavi, a group from Hessen expelled Chatti, They get the island between Meuse and Waal, current Betuwe. In the neighborhood live Cananefates, who resemble them according to the Romans in behavior and appearance. They speak the same language and had lived longer there. The Batavians come in a rather empty land. Live here less than a hundred thousand people. After their entry, which is about 120,000. The new peoples are placed under supervision of an administrative center. For the Batavians such a center arises around the current Valkhof in Nijmegen at the beginning of the first century in a place where some years before the beginning of the era was already a small settlement. Both Tungri as Batavi supply troops for the Roman Legions, The Batavi infantry, the Tungri infantry as well as cavalry, and they will fight in many regions under their own leades with their own banner. On the left you see the banner logo of the Batavi Iuniores on the right of the Tungri. The Batavi have been sent to many places. Still in 360 to Britain probably to counter a rebellion. Later the Batavi returned on the continent, but it is unknown when this happened. Four cohortes of the Tungri are known, they saw many places of the Imperium, also Mauretania. Imerix Servofredi is the first person known by name and image from what is now called the Netherlands. He was a Batavian, whose last location was the Roman legion base Burnum, in present-day Croatia, where he possibly died in the days of Emperor Tiberius (14-37) or Caligula (37-41). 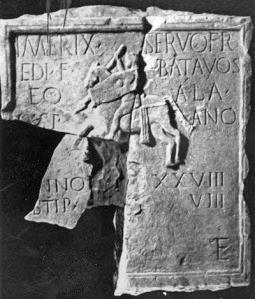 His tombstone was found there and is now in the Archaeological Museum Zadar.. He is depicted in the characteristic equipment of Germanic horsemen with a spear and an elongated hexagonal shield. Nothing more is heard of the Batavians. Perhaps they settled in areas where they had served as auxiliaries in the Roman legions, such as Hungary and England, and even Italy or the eastern borders of Persia. They are mentioned by Pliny for the first time a result of the reorganization of Emperor Augustus which was carried out around 20 BC and the Civitas Tungrorum was formed. It is not clear from which they were composed, but many think that under this name the former residents of the Sambre and Meuse valley, of the Hasbaye, the Condroz and the Ardennes were caught who had survived the massacres of Caesar, together with a group Germani Cisrhenani from the Julich region. A Cohort of Tungri was at Vercovicium (now known as Housesteads, Northumberland) on Hadrian's Wall. The cohort Tungri was split in the time of Hadrian in two Cohorts of Tungri, both cohorts 1000 men strong. In the Batavian war a cohort of Tungri defected to Iulius Civilis. For the Tungri is built a administrative center Atuatuca on the site of the present Tongeren. This is a fortified and walled fortress with stone houses for soldiers and veterans. Here settle traders and come markets. Local gentlemen are building a stone house in the vicinity of the board and get magistrate positions. There are schools and temples are erected. It seems that the ancient fortress of the Eburones on the edge of Mount St Pieter at Caestert then is abandoned. 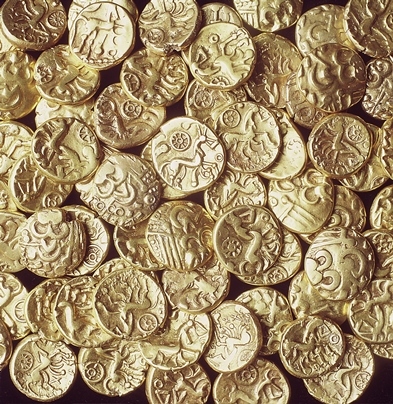 The fertile Loess region in Germania Belgica has always been one of the richest areas of Gaul. He produces corn, cattle and horse riders but also infantrymen for the Roman legions. In the forth century Maastricht becomes more and more important with trade and crafts, richer and more powerful than Atuatuca. It lies at the crossroads of two routes. From North to South, there is the river trade on the Meuse; and from East to West from Cologne over Aachen, Maastricht, Tongeren and Boulogne Sur Mer to England a trade route. The civil administration moves from Atuatuca to the new city Traiectum ad Mosam and the clerical administration with bishop Servatius follows. There are still Roman garrisons as the northern border of the empire is shifting to the south and now lies along the trade route from Cologne to England. veterans get here settlements. Among them may have been Romans as well as legionaries of foreign origins, who had no fatherland or were of nomadic origins. Germani Transrhenales who lived from Cologne to the Saxons at the North Sea were named Franci. In the second half of the third century they live around Xanten, where residents were previously called Sugambri. 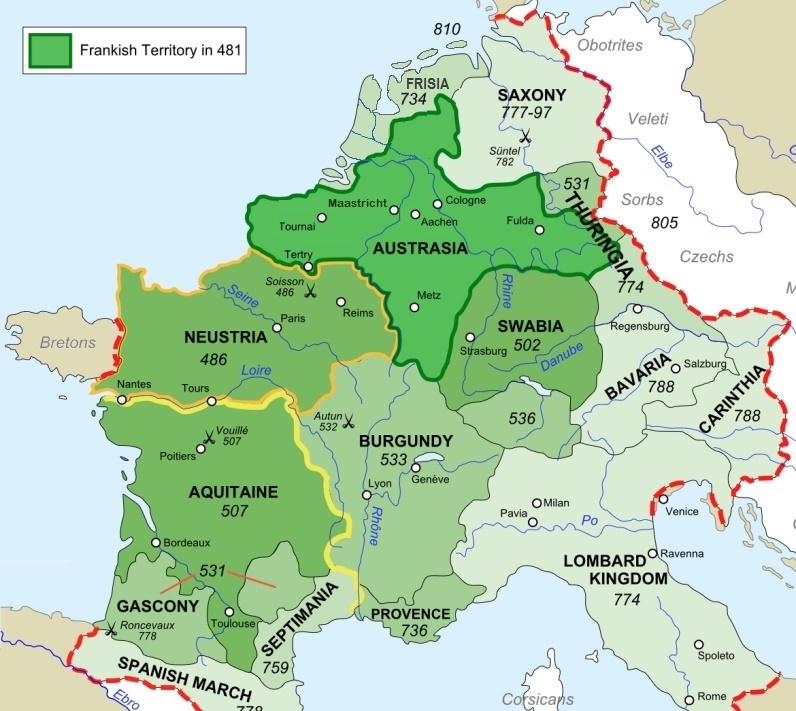 There are many destructive invasions of Germanic peoples (Franks) in northern Gaul. Atuatuca is destroyed, burned and abandoned around 270 as were the villas on South Dutch and Belgian territory. the region is depopulated. Around 350 are Salian Franks in Toxandria and in Cologne rules a Frankish king. Emperor Julian takes them in 358 as allies in the Empire. They provide auxiliary troops under their leaders Bauto and Arbogast who get high Roman ranks. Meanwhile, Franks do raids in the Middle Meuse region and occupy two castelli at Maastricht. After the death of the Great Roman general Aetius in 454 the imperial power ebbs away. Local men fill in the vacuum. The region of the former Tungri from the Rhine in Cologne to Cambray and Tournay comes under local Frankish rulers. The strongest under the Merovingian warlords was King Childeric in Tournai. He became a Roman Dux, army chief. His son Clodovech, 481-511 also called Clovis, expands its empire over much of northern and central Gaul. He is Roman Consul. It unites local rulers in particular, the Catholic bishops to whose faith he repents. At his baptism, his descent is named Sugamber. The Sugambri lived centuries earlier between Meuse and Rhine near Venlo. The possibly mythical progenitor of the royal dynasty is Merovech. They are called Merovingians. Their oldest family homelands lie in the former area of the Tungri, west of the Meuse. Not far from their probably native land Sicambria (Sugambria). A burial ground in the village Borgharen Maastricht dates from the seventh century according the golden coin given as Charon's obole. They were from a wealthy family. The man had a sword and shield, a bow and arrow and with him lie under more stirrups and food jars. The male Y-DNA haplogroup was J2(a1b). The mitochondrial DNA will be determined later. And now this man with the richest grave and the only one of whom his Y-DNA is known, from where came his ancestors. that must be from far. J2(a1b) is in this country very rare. He was a considerable horseman, a knight, He stems very probably from a Roman veteran of the auxilia, defending the northern borders of the Roman Empire. The borders lay where now the Belgian language border is. Veterans who did not return to their native land got mostly land where they had served last. He may have come from Italy but not excluded is the Caucasus, because there are regions where more than half of the population has this haplogroup. And if you want to read a name. Possibly he was a Sarmatian. The civitas Tungrorum became in that time the pagus Hasbania or Hesbaniensis. Now La Hesbaye in french, Hespenland in dutch. Around AD 600 lived here the ancestor of haplogroup G-Y15220, . Above the rivers live the Frisians. In later centuries, many leave their country when the climate is become word, colder and wet. Together with Angles and Saxons they leave for England. Their land is then taken over by the neighboring Angles, Saxons and Jutes who collectively take over the name Frisians. The area north of the Rhine will always be called Friesland. In the East of our country Saxes come in. In the eleventh century the notion Holland (Houtland = woodland) arise, land of forests. Agriculture, livestock, fishery and trade create wealth and so growth, so that around the year 1500 nearly a million people lvan live in the Netherlands and in 1650 almost 2 million. This growth is both spontaneous partly by entry of immigrants from Belgium, France (Huguenots), Germany, Spain and Portugal (Sefardim). Large growth and influx originates in the Golden Age from all parts of Europe, traders scientists artists and due to the liberal views many intellectuals who due to the almost complete absence of censorship van publish free. During the last century many people from their former colonies chose the land of their former oppressor rather than their newly independent country. Dutch industry took in a period of rapid growth missing workers from Asia and Africa. And as always, our country is open to refugees in spite of current against forces. From a demographic point of view, this recent influx is convenient since our birth rates remain far below death rates, and so we are below the replacement value. - Nature Communication, A substantial prehistoric European ancestry amongst Ashkenazi maternal lineages, Marta D.
Costa e.a., Published 8 October 2013. Achaeologists, session: The bioarchaeology of the neolithic Carpathian Basin, Pilzen Czechia, 6 september 2013. - Chang, Hua'an, The Eastward Migration of Sauromatians, Taipei China 2011, revised edition in preparation. Genetics, 74: 539-546. doi: 10.1111/j.1469-1809.2010. - Gaius Julius Caesar, Commentarii the Bello Gallico, Rome 51 vc. - Cambridge DNA services - Discover your genetic heritage - mtDNA. - Jared Diamond, Guns, Germs and steel, The Fate of Human Societies, NewYork/London, 2000. Agrargeschichte, Vom Neolithikum bis zur Schwelle des Industriezeitalters, 1979. / Jockenhhöve / Bender / Capelle, Deutc Agrargeschichte, Vor- und Frühgeschichte, 1996. - Jean Manco, Ancestral Journeys - The peopling of Europe from the first venturers to the Vikings, London 2013. Farmers in Barry Cunlife The Oxford Illustrated History of Prehistoric Europe. Y Chromosome Phylogenetic Tree. The American Journal of Human Genetics, Vol.92, Iss. 3, 454-459, 28 February 2013. - The Encyclopedia of Global Human Migration, Immanuel Ness, 2013. - Plos Genetics. Meerdere artikelen, hier niet expliciet vermeld. - J.C. Schalekamp, Bataven en Buitenlanders - 20 eeuwen immigratie in Nederland, 2009. - Alois Seidle, Deutc Agrageschichte, Frankfurt am Main, 2006. - ISOGG, Y-DNA Haplogroup Tree 2013.